Contact us to help you create a personalised package to suit your needs and budget. We can arrange a boat transfer for you, your family and bridal party from a pick-up location of your choice to your wedding reception . The Amalfi Coast is an ideal location for your photos. It will be the most memorable experience. Whether it will be just the bride and groom or several guests, our range of elegant boats offers both comfort and appeal enabling your wedding party to arrive in style. 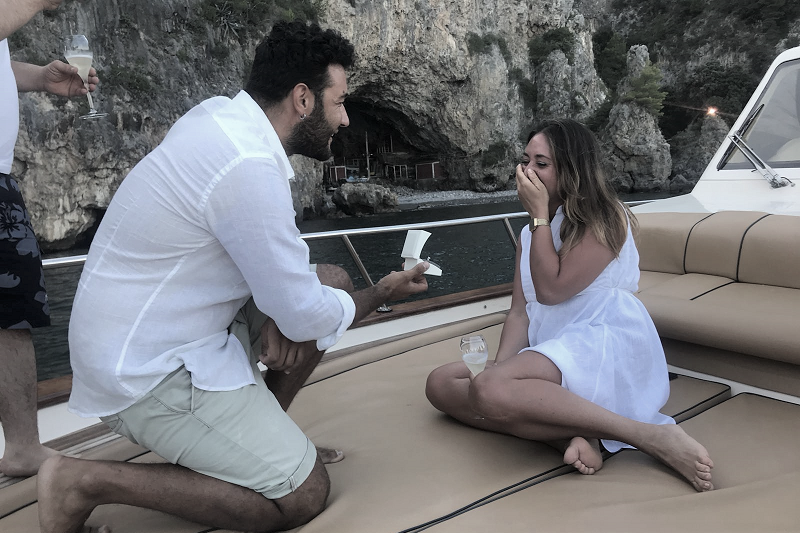 What a better way to propose than to be with your loved one on a boat under the Faraglioni rocks in Capri or at the island of Li Galli infront of Positano at sunset?....Simply breathtaking! During our romantic Sunset cruise, just the two of you will relax in style as our expert captain gently guides the boat through the beauty of the Amalfi Coast looking for the best spot. When you propose your partner will surely say yes ! A day she will never forget ! If you like we can also supply fresh flowers, roses or champagne, while a range of alcoholic and non-alcholic beverages are available from our on-board bar. Our steward will be your waiter, but will also give you plenty of privacy between service. After the cruise, we can either take you to a nice restaurant or nightspot if you would like to continue the wonderful celebrations, otherwise we can take you back to your hotel. Romantic sunset trip , day excursion to Capri, half day private boat tour along the Amalfi Coast, wedding transfer .. 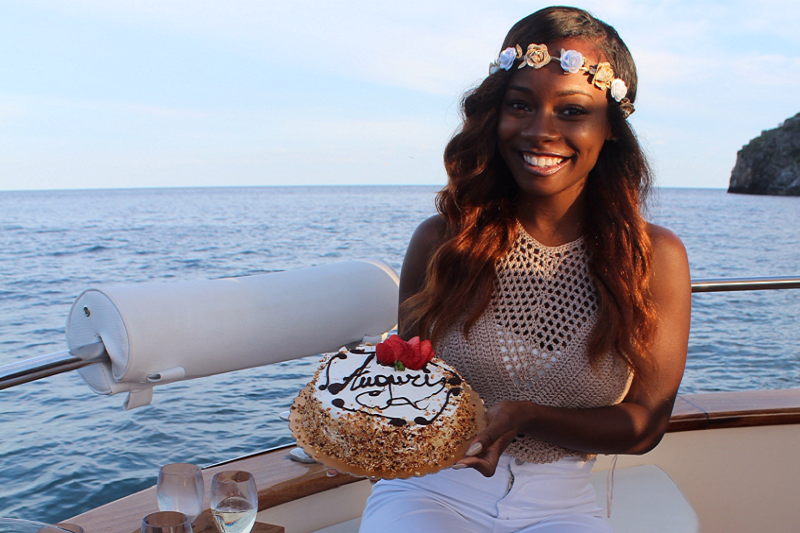 If you’re planning an unusual birthday or an intimate get-together with your nearest and dearest,why not organize a boat tour along the amalfi Coast or to Capri with a swim in clear water of a nice inlet. We can arrange for you a champagne toast with some cakes, aperitif on board, lunch in a typical restaurant by the sea... we will work with you to ensure a memorable day! We take care of every last detail, from booking to disembarking, to ensure you can enjoy the moment all day long. It all flows from abiding emphasis on service and luxury, and a natural love of our area. Free drinks are provided on board . Alchool could be provided upon request as well as light local snacks and some fruits. If you wish we will be glad to assist you and suggest the best seaside restaurant of the area, where to enjoy the most delicious specialities of our tradition. Our captains are fully licensed and deeply experienced, and they want to make your day a memorable experience. We have a variety of boat categories from smaller relaxing boats to bigger and faster. What ever your preference is we will provide the best options . Contact us to request a quote.